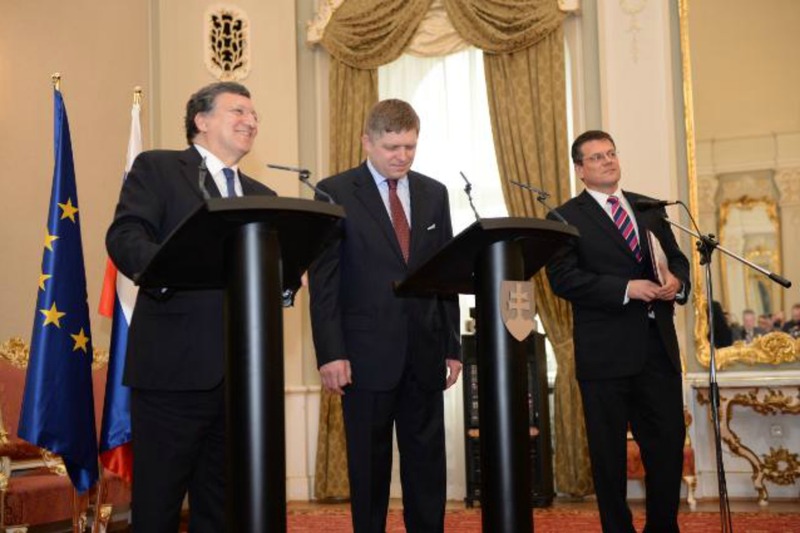 Commission President José Manuel Barroso, Slovak Prime Minister Robert Fico and Slovak Commissioner Maroš Šef?ovi. Meeting in Bratislava Monday (April 28), Commission President José Manuel Barroso, Slovak Prime Minister Robert Fico, and Ukrainian Energy Minister Yuriy Prodan attended the signing of a Memorandum enabling reverse gas flows from Slovakia to Ukraine. Ukraine receives reverse gas flows from Poland and Hungary, and a similar scheme with Slovakia is close to completion. Although this is basically Russian gas, it is still cheaper than the price of around $400 per thousand cubic metres (tcm) Kyiv was paying until the end of last year. After former President Viktor Yanukovich refused to sign the EU-Ukraine Association Agreement and decided to develop relations with Russia instead, Gazprom brought down the price of its natural gas for Ukraine by a third – to $268 dollars per tcm. But after Yanukovich fled the country and a new pro-European government took over, Gazprom raised the price by 80%, to $485 per tcm. Based on the solution which is presented in the Memorandum, the existing and unused Vojany pipeline at Ve?ké Kapušany on the Slovakian side will be modernised during a short construction period. There is a clear perspective that 22 million cubic meters of gas a day can flow from Slovakia to Ukraine via the Vojany pipeline as from autumn 2014. This corresponds to approximately 8 billion cubic meters a year (bcm/y). Reverse gas flows from Slovakia, Hungary and Poland to Ukraine could reach up to around 16-17 bcm/y, around a third of Ukraine’s annual demand, Fico was quoted as saying by Reuters. Fico said that his European Union nation would be able to deliver up to around 9 bcm starting in the autumn, which would mean a total of up to around 17 bcm when adding the reverse flow capabilities from Poland and Hungary. “With the reverse flow that comes into consideration from Hungary and Poland we are talking about a volume of some 16 to 17 bcm that we can deliver to Ukraine [per year],” Fico said. Energy Commissioner Günther Oettinger called the signature of the Memorandum “a milestone”. Oettinger said that deliveries from EU member states offer Ukraine access to gas priced on the basis of fair and transparent principles. The Commissioner said it was important that Ukraine, as a member of the Energy Community, makes swift progress in aligning its legal and regulatory framework with the EU energy legislation. The Energy Community is a EU initiative initially designed to bring closer the energy systems of the Western Balkans to EU standards. In 2009 Moldova and Ukraine acceded to the initiative. Financially-strapped Ukraine has been anxious to obtain affordable natural gas since Russia tore up a discount negotiated under Kyiv's former president Viktor Yanukovich and this month raised the price it must pay for gas from Russian supplier Gazprom by 80%. Relations between Ukraine and Russia have been in crisis since the pro-Russian Yanukovich was ousted by protesters seeking closer ties with Europe, prompting Russia to seize and annex Ukraine's Russian-majority Crimea region. The gas price hike from $268.50 per 1,000 cubic meters to $485.50 imposed by Moscow on Kyiv could cut gas supplies from Russia to the EU through Ukrainian territory, Yuriy Prodan, Ukraine's minister of energy and coal industry said recently [read more]. Slovak Prime Minsister Robert Fico said on 10 April he supported projects to send gas to Ukraine but needed to ensure Slovakia gets paid and avoids violating contracts with Gazprom [read more]. This reverse gas flow stunt is illegal without Russia’s okay but who pays attention to agreements anymore? Certainly not the EU since 21 Feb 2014.